Counting Down to Paw Palooza! Wow, less than one week until the extravaganza! We’re excited and hope you are, too! 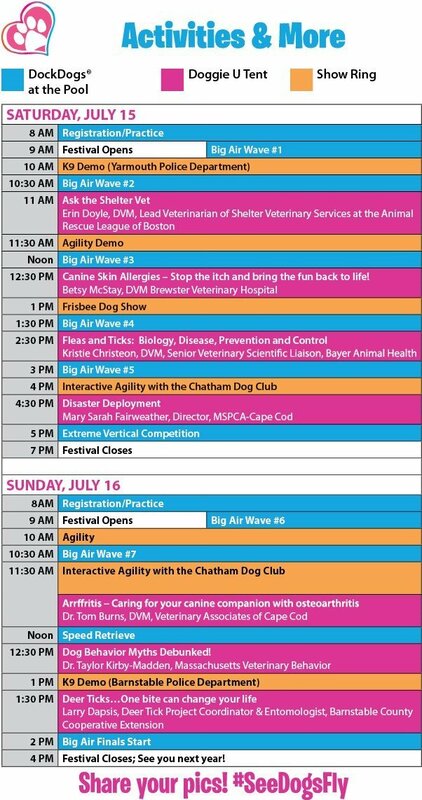 Here are a few details for the second annual Agway of Cape Cod PAW PALOOZA on July 15 & 16! COMPETITOR WAITING AREA: We have a designated competitor lounging zone called “Dog Town” where you can setup your base camp for the day. Its located on the adjacent softball field to the Dock, which will make it easy to get back and forth to the competition, especially if you have multiple dogs in the same wave. See “Field Layout” below. IMPORTANT! If you would like to park your vehicle here, you must arrive BEFORE the festival opens to the public at 9am, and stay until at least 5pm. Otherwise, vehicles are not permitted to drive on and off the field during festival hours. To drive out to ‘Dog Town’, you must come to the vendor unloading area and check-in with the attendant. We will guide you on to the field. See below image – “Overhead View” for a description on where to go. Admission is $5 donation for adults (kids 12 and under and dogs are free). We accept cash, checks, and credit cards. All event proceeds benefit the MSPCA and Animal Rescue League of Boston. We will be providing a few 10′ x 10′ tents and chairs in the competitor waiting area to provide a little shelter while you’re in line for the dock. Please be cognizant of other teams around you. If you have any questions about the festival, look for a Palooza Patrol member wearing the tie-dye t-shirts. My name is Jess Thomas, I am the event coordinator and also competing with my dogs in a few of the big air waves. 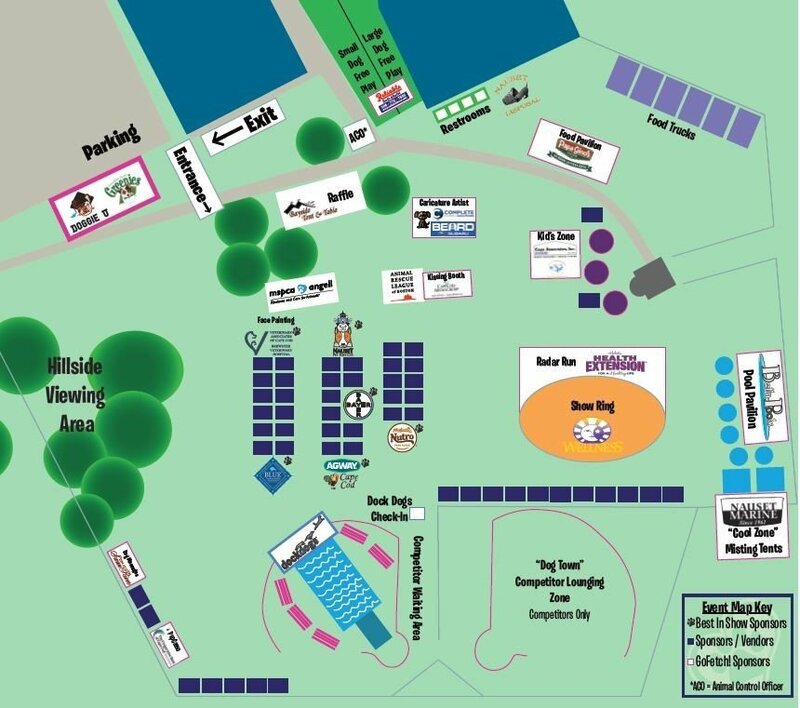 So you’ll most likely be able to find me around the dock or at the Agway of Cape Cod tent. If you’re a first-timer (like I was last year), feel free to pull me aside and pick my brain! Be sure to carve out plenty of time to enjoy all the fun activities that Paw Palooza has to offer! 75+ Vendors, Kids Inflatables, Face Painting, Caricature Artist, Puppy Facials, Doggie Massages, a Frisbee show, K9 Police demonstrations, seminars at Doggie University, food trucks, and a HUGE raffle!!! COMPETITORS: If your dog is not dog-friendly or human-socialized, please keep them securely AWAY from festival attendees. We ask that you tie a red ribbon or scarf around their leash so that Palooza Patrol members can easily identify them and assist you by keeping others away. If you see a dog fight or bite, please report it to a Paw Palooza staff member and ask the dog owner to report immediately to the Yarmouth Animal Control Officer Booth. 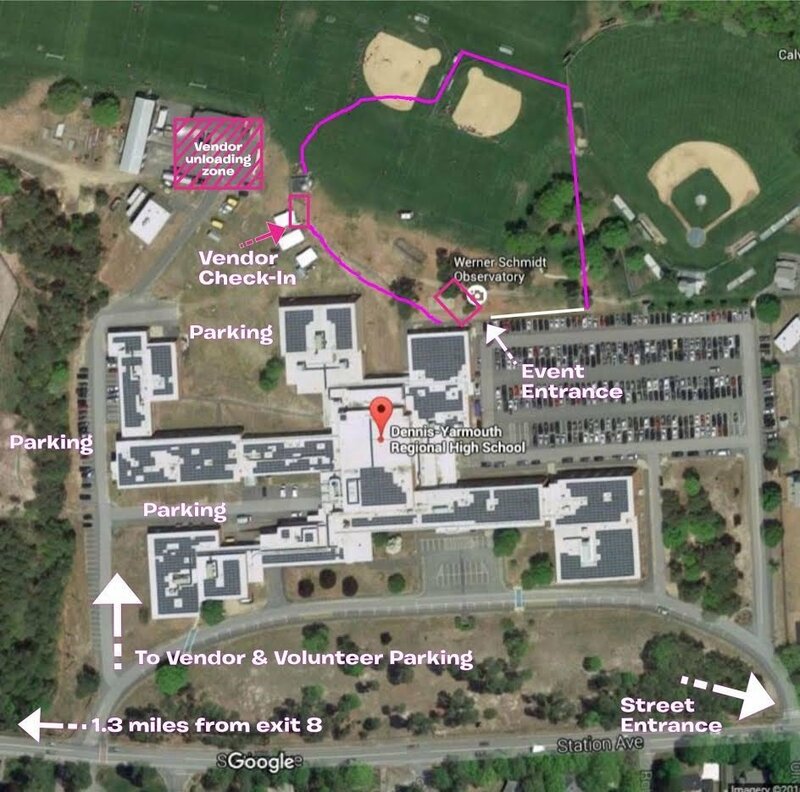 The booth is stationed next to the Doggie Free-Play Zones near the back of the high school building. If you see a dog owner that does not have good control of their dog, or their dog is exhibiting aggressive/fearful behavior, report it immediately to a Paw Palooza staff member or the Animal Control Officer. All dogs are required to be on a leash no longer than 6-feet in length. All retractable/flexi leads must stay in locked position at 6’ or less at all times. In the event that someone needs medical attention, there is an ambulance staffed with EMTs located near the Volunteer Tent. Thanks again for your support of this great event to benefit the Animal Rescue League and MSPCA shelters on the Cape! We’re looking forward to a fun-filled weekend! Feel free to reach out with any additional questions prior to next weekend.